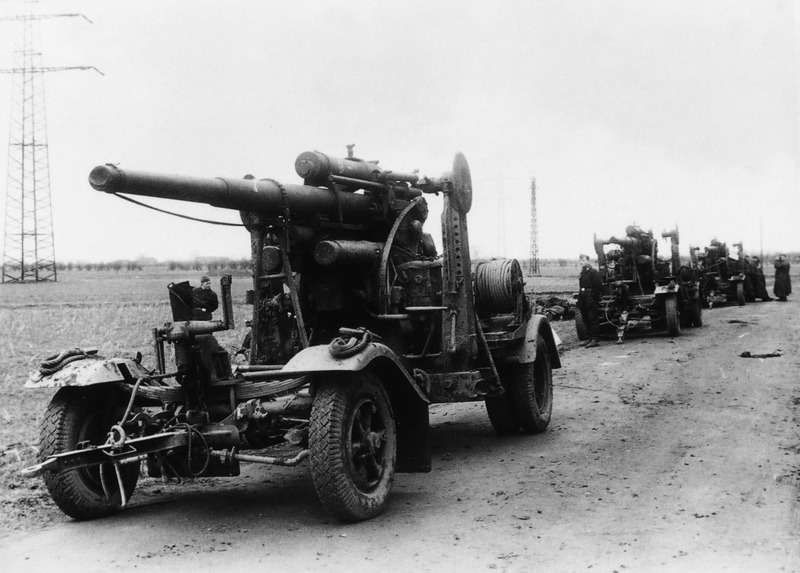 Production of Germany’s first modern light anti-aircraft gun, the FlaK 18, ended in 1936 to allow manufacture of an improved model, the 3.7cm FlaK 36, that was the FlaK 18 gun on a new mounting carried on a two-wheeled carriage and served by an eight-man detachment. The ballistics of the FlaK 36 were the same as those of the FlaK 18 but when, in 1940, there appeared a new range of ammunition characterized by one rather than the original two driving bands, the FlaK 36’s chamber was shortened accordingly. The FlaK 36 was originally sighted with the aid of the Flakvisier 35 or 36 until Zeiss developed its clockwork-powered Uhrwerksvisier that was accepted for service as the Flakvisier 37. Equipments fitted with this sight were FlaK 37, and were in all other respects identical to the FlaK 36. The FlaK 36 and 37 became the German forces’ standard defence against low-flying warplanes, and were used in 9- or 12-gun batteries by the land-based forces. The weapons were also fitted on trains, surface warships, U-boats, FlaK towers and a number of self-propelled mountings to create the 3.7cm FlaK auf Lkw Mercedes-Benz 4500 A, the 3.7cm FlaK auf Maultier, the 3.7cm FlaK (Sf) auf Zugkraftwagen5t SdKfz 6/2, and the mZgkw 8t mit 3.7cm Flak 36 SdKfz 7/2.